Cardinal Walter Brandmüller Credit: Bohumil Petrik/CNA. 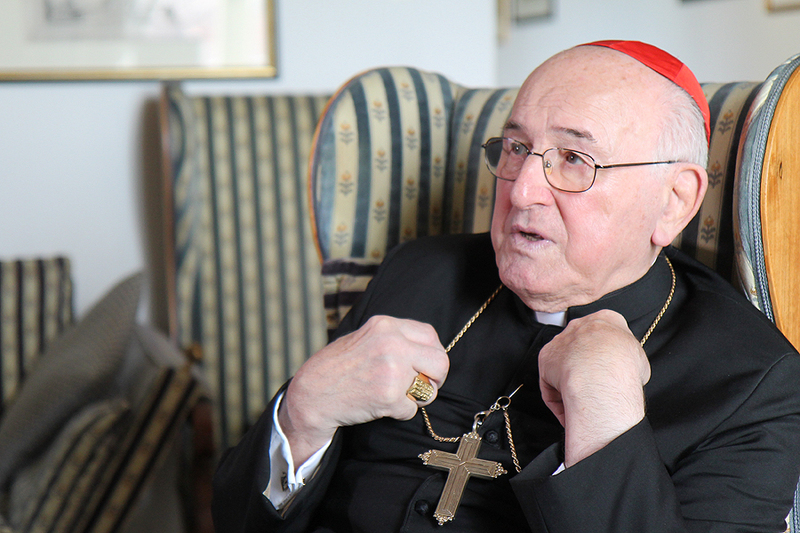 Cardinal Walter Brandmüller—one of the four cardinals who submitted dubia to Pope Francis regarding the interpretation of Amoris Laetitia—has said that any “correction” of the Pontiff would be done privately. Cardinal Brandmüller was responding, in an interview with Vatican Insider, to published remarks by Cardinal Raymond Burke, who has said that a correction of the Pope could be made sometime early in 2017. Cardinal Brandmüller said that Cardinal Burke was speaking for himself rather than as a representaive of the four prelates who had submitted the dubia—although heacknowledged that other cardinals might agree with Cardinal Burke. At the same time, Cardinal Brandmüller said that he felt sure Cardinal Burke, too, would agree that any “fraternal correction” of the Pope should be made “in camera caritatis,” without a public statement. And you are getting a response. Silence. Silence which implies consent, that being a rejection of clear and articulate adherence to clearly defined doctrine. Hence the need for the dubia in the first place. So the “correction” of the Pope is not necessarily a letter addressed to him, but a formal letter addressed to the faithful restating defined doctrine in contrast to a pregnant silence. A “correction” of the Pontiff to the dubia that is done privately renders it ineffective and harms the faith of Catholics. Why, because you want to see this Pope publicly shamed? and you should learn how to punctuate a sentence. thomas nawn, Cardinal Burke is one of the very great Churchmen of our era! He always stands up for Christ’s true teachings, no matter what! He respects Christ, and respects our Church’s great and holy Traditions, including her ancient, beautiful, meaningful SACRED VESTMENTS! He takes the time and care to wear these SACRED VESTMENTS!! Many people of our era– are BRAIWASHED to reject beautiful, sacred items, and traditions, of our Church!! Modernism is often quite quite stark, ugly, banal, Godless, hateful, diabolic, meaningless– dehumanized, and rejecting of all beauty and idealism– rejecting of the exquisite realms of God, in Heaven!!!! We are so deeply BLESSED, to have the few, brave, committed Catholic leaders, that we have today, in Rome! Cardinal Burke is one of these few! They sacrifice their lives, for us, for Christ— to lead us truthfully to Him, to Heaven! Cardinal Burke built a beautiful Shrine of Our Lady of Guadalupe, in his native Wisconsin, at La Crosse. Good place for a pilgrimage– especially when burke might be there, to offer Holy Mass! Burke daily keeps a Holy Hour, like Ven. Abp. Fulton J. Sheen, and he also daily says his Rosary, and the Divine Office, too! A fine example, for others! It is always very important, if we have made our commitment to Jesus Christ– to stand firmly beside Him, and find true Church leaders to help guide our footsteps to Him. And ignore all the rest! Our goal is Heaven! We must sacrifice all, for that “pearl of great price!” Mediocre, (and near-heretical!) Churchmen, like our current Holy Father, Pope Francis– will someday be nearly-forgotten, in history! And they need our prayers, during their brief reigns– for God to help them, and guide them, with His Graces! !